BELLEVUE, Wash., Sept. 20, 2018 /PRNewswire/ -- Nintex today published the agenda for its upcoming Nintex World Tour event in San Francisco. It will showcase how California's leading transportation agency and private sector financial services and construction companies are digitally transforming operations with no-code process management and automation solutions from Nintex and Promapp. 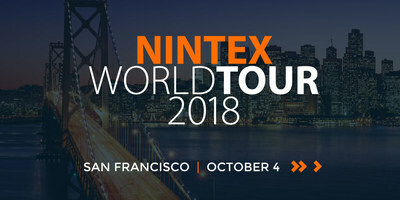 Visit www.nintex.com/NWT-SF to register for the Nintex World Tour event on October 4 at the Parc 55 San Francisco hotel from 8:30 a.m. to 4 p.m. PDT. The San Francisco Municipal Transportation Authority (SFMTA) is a department of the City and County of San Francisco that oversees Muni (the historic Municipal Railway), parking and traffic, bicycling, walking and taxis. Virdis Gamble, IS Principal Engineer at SFMTA, will discuss the role that Nintex plays in the SFMTA's digital transformation journey and will show how Nintex Workflow and Nintex Forms are being used to transform critical business processes. Pankow, a California-based construction firm focused on finding better building solutions to support client success, is using Nintex Promapp to orchestrate process mapping and process improvement across the organization. Margarett Buschkamp, Senior Operational Excellence Manager, and Jamie Lopez, Learning Analyst at Pankow, will discuss how Pankow is leveraging process knowledge to become a "Learning Organization." SAFE Credit Union, headquartered in Folsom, Calif. serves the financial needs of more than 220,000 members and has successfully streamlined its member referral and expense reimbursement processes with the Nintex Platform. Lixa Anderson, Assistant Vice President, Business Systems at SAFE Credit Union will discuss how this leading financial services firm is using Nintex to improve the way employees work. "We started our journey by digitizing employee reimbursements with the Nintex Platform. Now we're quickly automating processes everywhere," said Lixa Anderson, AVP at SAFE Credit Union. "Nintex is critical to how we operate at SAFE Credit Union – and demand for what Nintex offers grows with every digital workflow we execute." Today the Nintex Platform includes powerful, easy-to-use capabilities for process mapping and management, modern forms, advanced workflow, document generation, process intelligence and more. End users save an average of 60 minutes for every complex process automated with Nintex's no-code platform according to a Forrester Total Economic Impact™ Study.